A road diet is a great way for cities to reclaim some of the excess street space they’ve dedicated to cars—generally preserving traffic flows while improving safety and expanding mobility to other modes. But just as food dieters have Atkins, South Beach, vegan, and any number of options, road diets come in many flavors, too. Urban planner and Walkable City author Jeff Speck, in collaboration with graphic artist Spencer Boomhower, takes us on a tour of four types of street diets in a deliciously clear new video series. Here’s a taste. In this case we have three traffic lanes flanked by two parking lanes. That’s an awful lots of city street space for cars, so here Speck proposes a “3-to-2” road diet: by removing one traffic lane and narrowing one parking lane, a city can make room for a protected two-way cycle track beside the curb. The 3-to-2 diet preserves travel times while increasing safety; as Speck point out, a similar design change made in Brooklyn reduced injury crashes by 63 percent. The most classic road diet converts four lanes of traffic into three lanes: one in each direction, plus a left-turn lane in the middle. 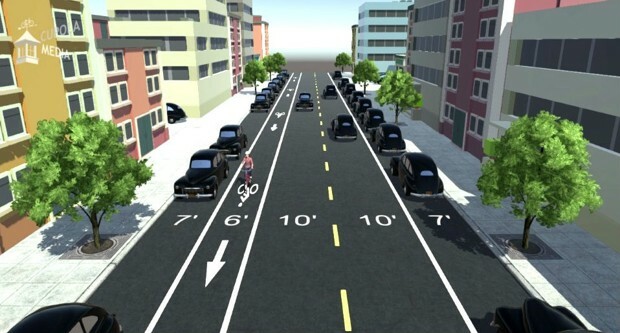 By eliminating one full car lane, the “4-to-3” diet also leaves room for bike lanes on both sides of the street—though this extra space can be used for sidewalk extensions or even dedicated transit lanes, too. A 2013 study of 4-to-3 diets found major safety benefits: a 47 percent drop in crashes in small metros, and a 19 percent dip in big cities. "Bike lanes are good; a cycle track is better, and requires no more roadway,” says Speck in the road diet’s voiceover. Take the road that we ended up with after the 4-to-3 diet, for instance. 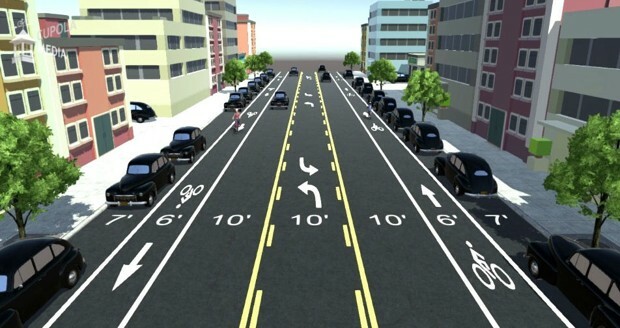 In this design, bike lanes run beside car traffic on either side of the street, increasing the potential for collision. But by sliding one parking lane off the curb, this diet makes room for a two-way cycle track protected from moving traffic by a buffer strip as well as a lane of street parking. This time we focus on a 40-foot street with two 12-foot lanes of opposing traffic and two parking lanes at the curb. 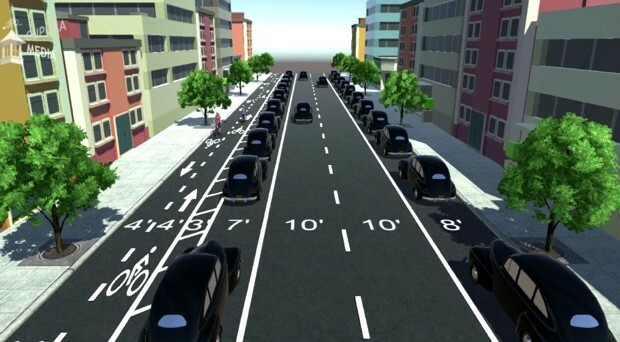 Many cities have adopted 12-foot lanes with the assumption that they move more traffic; in fact, as Speck has argued at CityLab before, they present a major safety hazard for cities by encouraging faster driving. 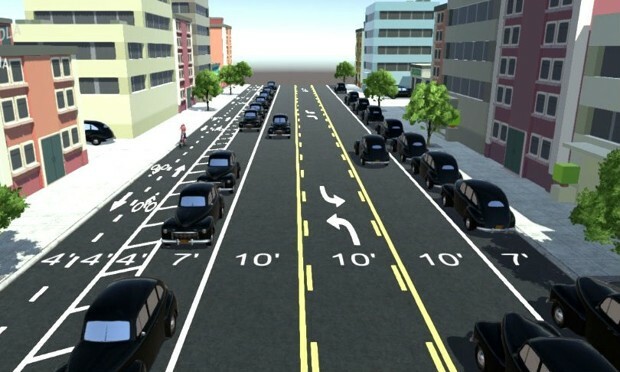 He recommends slimming them down to 10 feet—a design configuration that leaves room for a bike lane and makes the street safer, even as it more or less preserves traffic flows.